My statement to the City of Phoenix Site Plan Review team concerning the proposed apartments for Central & McDowell in midtown Phoenix. As we have seen this afternoon, a siteplan for an apartment complex at a key corner in the City of Phoenix has been presented. Many people here have talked about where this building is but I want to explore a different dimension: when this building is in the Phoenix urban story. Recently, Downtown Phoenix played host to two large-scale music festivals attracting thousands of people, the VIVA PHX festival on March 7 and the weekend-long McDowell Mountain Music Festival at Hance Park at the end of March. Today also marks the return to classes for the students at Arizona State University, including the almost-20,000 students studying at the downtown Phoenix campus alone. Major events of the February 2015 Super Bowl will be sited in Downtown. Speaking of Hance Park, over two thousand people showed up at Hance Park on March 27 to see the unveiling of the new Hance Park Master Plan to get a feel for what public space and the urban ethic in Phoenix will be. Part of the success of that plan depends on increased density around the park; while this project provides modest density, it is nowhere near what it can or should be. Actually, the success of many urban-focused initiatives depends on increased density in our urban core. There is interest from both current and future urban dwellers—and from those in the urban academy—that the City of Phoenix get this urban moment right. The City of Phoenix’s zoning scheme cites this area as a “downtown gateway” as part of the Downtown Zoning plan. I see it, too, as a midtown gateway, welcoming people to midtown Phoenix and our grand street, Central Avenue. As part of the Downtown Gateway, buildings are allowed to go up to 250 feet. While I am keenly aware that height and good urban design are not always congruent, a good urban design makes gestures to its geographic place and its moment in history. This is an once-in-a-lifetime opportunity to put something of quality compatible with place and time on this site…but this project falls woefully short. 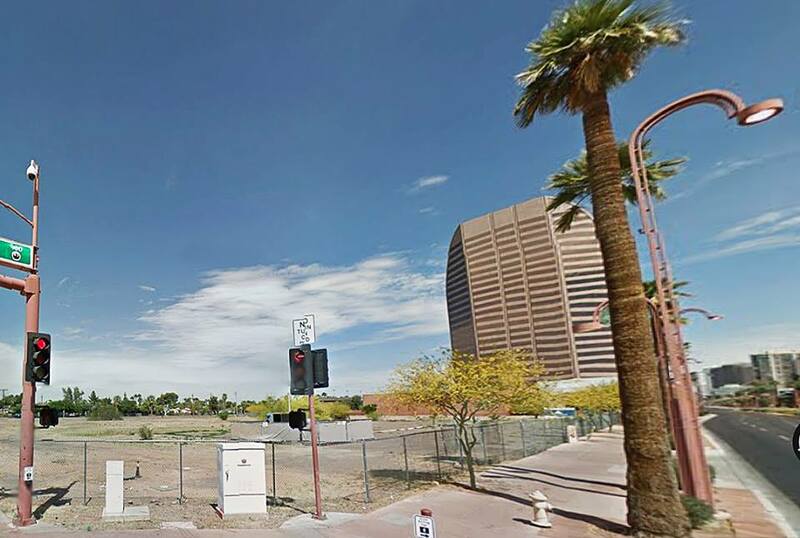 An apartment complex is proposed for a key corner in midtown Phoenix. This is a good thing, right? Think again. This is a missed opportunity. 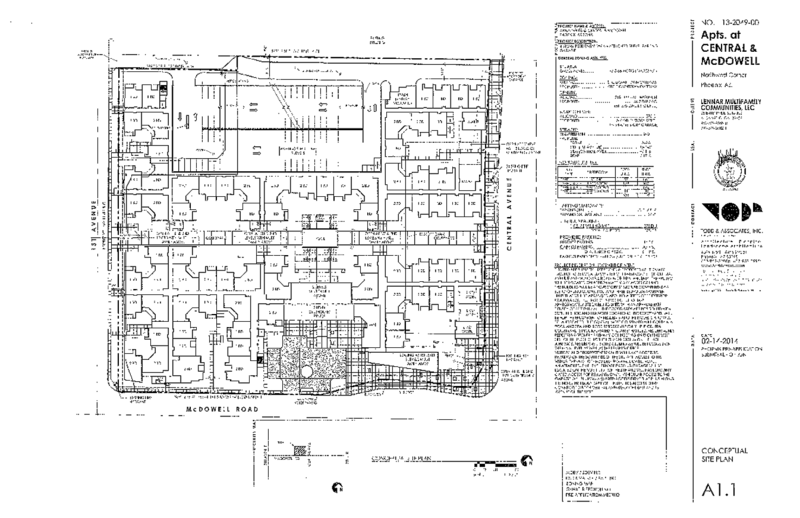 There has been much excitement lately about a new apartment complex that is proposed for the northwest corner of Central Avenue and McDowell Road at the southern boundary of midtown Phoenix, situated in the heart of the Midtown Arts District, near the McDowell Road light rail station, and near the excitement surrounding Hance Park. As such, the design and architecture of the building will celebrate not only this location but this unique moment in urban Phoenix history, right? Oh, if only that last sentence were true. The design foisted upon us by the developer and architect fits in more to a suburban context in Anytown USA than this geographic place and historical moment. The building doesn’t even attempt to make gestures to its geography or its moment in history; it is a four-story building that makes no design cues to anything but its own parking lot. Given what’s proposed, the fact that this project is garnering excitement from civic leaders and neighborhood interests is very disappointing. I’ve frequently said on this blog that “we must do better” in Phoenix and this is one project that needs to do better. But in thinking about what “better” means, I’ve only thought about one thing: This project must be stopped before it gets farther along in approvals and the building process. Such a grand re-design is needed that scrapping what is proposed, hiring an architect with an acute knowledge of the urban Phoenix condition, and coming up with a different plan is the only solution. For any project that will go on this site, we must ask this fundamental question: Is this project worthy of being a downtown and midtown gateway? As part of the downtown Phoenix zoning overlay, the northwest corner of Central & McDowell is designated as “downtown gateway,” meaning that buildings can go up to 250 feet in height and, more importantly, be built right up to the street. This design is neither of those. Its setback from Central Avenue is in the neighborhood of 20 feet and its height is, as mentioned above, four stories. I am keenly aware that height doesn’t necessarily equal design quality. In fact, I’m more in favor of buildings that are 10-12 stories in height (a consistent and continuous density) than building really tall-for-Phoenix buildings for the sake of being really tall. But consider: One of the requirements for the true success of Hance Park’s redesign will be density on and near the park. My friend Tim Sprague’s Portland on the Park project will provide good density; no, I’m not being paid or encouraged to say that. Many have said that a grocery store will make this project work and although downtown Phoenix desperately needs one, integrating a grocery store with this project won’t save it. Phoenicians should look at the new Lunds store in downtown Saint Paul, Minnesota, recently opened and integrated with new apartments in the former Saint Paul Public Safety Building (which was a façadectomy), as a model. An all-stick frame construction, as is proposed, will not fit a grocery store…full stop. This is a once-in-a-lifetime opportunity to put something of quality on a key vacant lot. To put the proposed project here is a waste of a lot of things. I will say it again, Phoenix: we must do better. We simply must.